Fine, but do you speak the same language? What’s the point of the best lecture with best intentions if it doesn’t suit you and your needs? 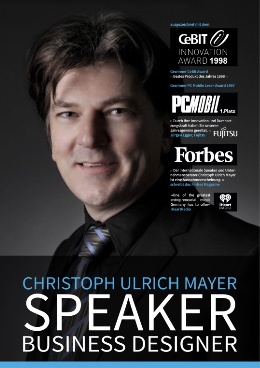 Christoph Ulrich Mayer understands how to put himself in your situation. Having a feeling for your individual needs and requirements, he will find the right words to motivate, inspire and excite his listeners. His lectures are captivating and full of charisma and show ways to increase personal commitment, activities, turnover and customer relations in the long term.